If you only have one source of addresses you won't need to use the dialog. But if you have multiple contacts folders or address books, you will use this dialog to change which address book is shown first when you open the address book directly or click the To, CC or BCC buttons when composing messages. 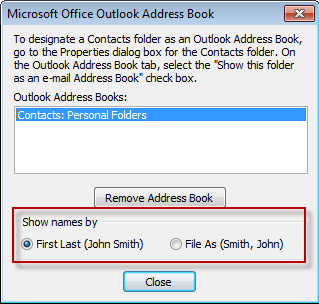 You'll also use it to change which Contacts folder is used as your default for saving new personal contacts and to change the search order when Outlook resolves addresses. You can add or remove Contacts folders as address books from this dialog. 2. Tools, Account settings, Address book. Use this dialog to change how addresses are displayed in the address book. Your choices are using the File as format or First Last. If you have a "ghost" contacts folder remove it from your profile with this dialog. You can add additional address books (such as LDAP) to your profile using this dialog. Use this dialog to control how the contacts are filed in your Contacts folder. If you use Outlook 2007 this is also where you'll find the option to show the Contacts field on Outlook forms ('Contact linking'). Published December 19, 2007. Last updated on June 17, 2011.